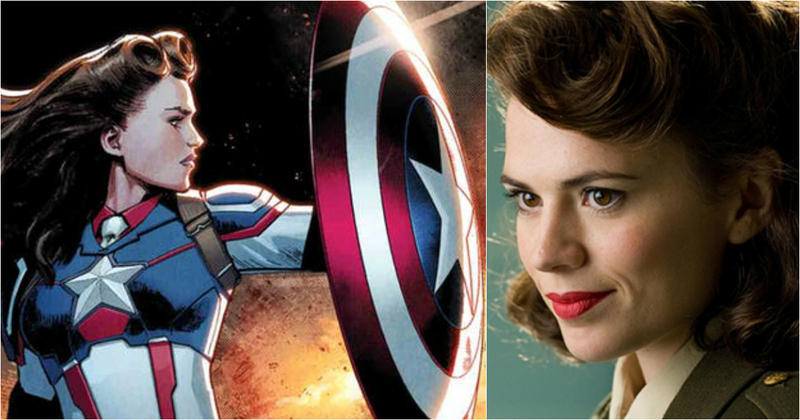 Marvel Comics Update: Peggy Carter Is The New Captain America!! Peggy Carter, believe it or not, did not just win the heart of Steve Rogers aka the Original Captain America but the mantle of the Red, White and Blue Shield as well. In a new issue of the Exiles, Peggy Carter is actually the Captain America of an alternate reality timeline. Peggy Carter is a pretty well-known name in Captain America issues. She was the first woman ever to make Steve Rogers fall in love with her. She was one of the founding members of Strategic Homeland Intervention Espionage and Logistics Division now popularly known as S.H.I.E.L.D. She has had several appearances in the Marvel Cinematic Universe movies. Her portrayal by Hayley Atwell further cemented her popularity among both comic book and non-comic book fans. Marvel fans really loved the chemistry between her and Chris Evans in the first Captain America movie which landed her the TV series based on the character. She has voiced Peggy in Avengers: Assemble animated series. Peggy Carter last appeared in MCU in Captain America: Civil War where Steve Rogers come to her funeral to bid her goodbye after having served her during WW II. 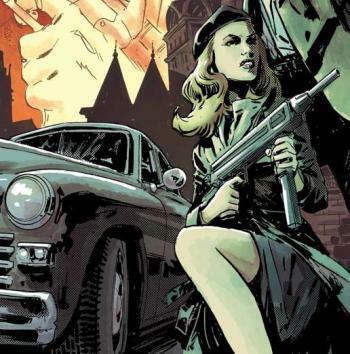 She left a deep void in the life of Rogers which soon got filled he seduced her niece Sharon Carter who is an intelligence agent (Agent 13) in the Berlin based joint terrorism task force. She helped Team Cap catch the people responsible for UN bombings and understand the larger conspiracy. All in all, Peggy Carter is the Godmother of the Marvel Universe. 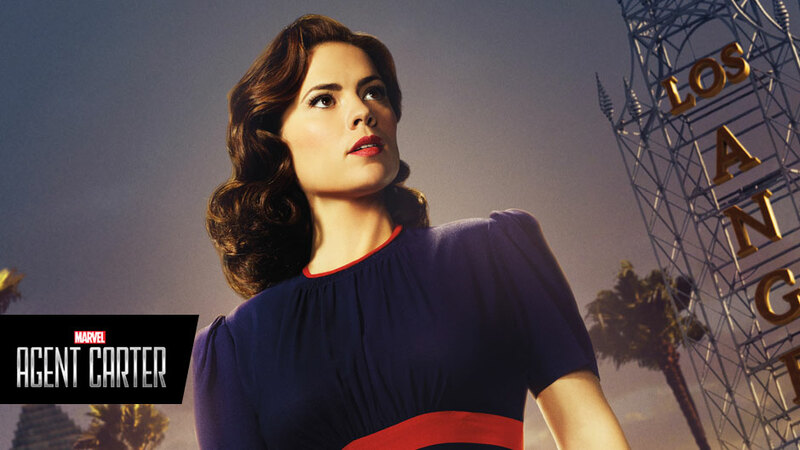 We are still not sure as to what the future holds for Peggy Carter within the larger Marvel Cinematic Universe. 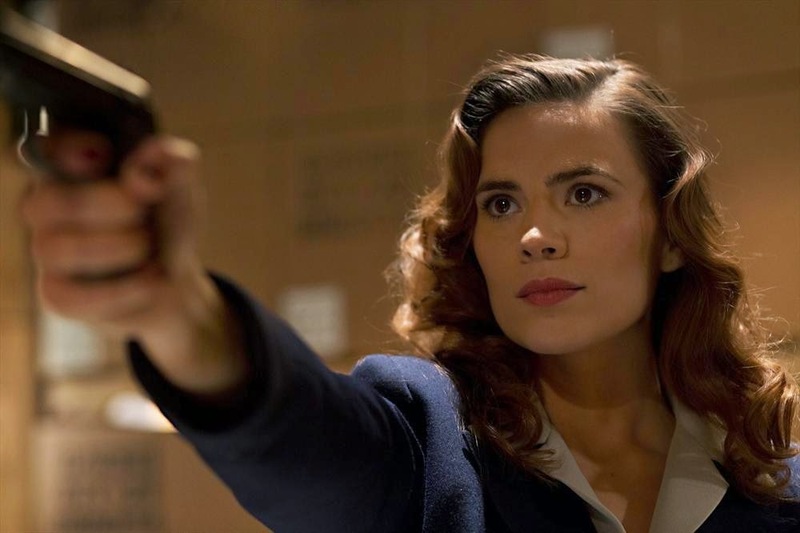 Atwell fans are striving for the MCU overlords to include Peggy Carter in Captain Marvel. A team-up of sorts between a super spy and a superhero could be just the blockbuster MCU is looking for. Given her immense contributions to the Marvel Legacy, it won’t come as a surprise if Peggy shows up in any period piece that Marvel tries to explore in either the comic book universe or the movie universe. Atwell’s Peggy has a fighting chance to return to the MCU. While the theatrical comeback may still be just a ‘maybe’, her comic book counterpart is doing leaps and bounds as we speak. Marvel Comics has recently launched the May solicits for the new direction Marvel will be undertaking with its new issues. While the releases have plenty of material to be excited about, one cover does stand out. Exiles #3 written by Saladin Ahmed (of Black Bolt fame) and features several oddball characters like a Cartoon Wolverine, Tessa Thompson’s version of Valkyrie from Thor: Ragnarok and a future Kamala Khan. One newly introduced character does take the cake. The new character we are talking about is that of Peggy Carter wearing the star-spangled uniform as the new Captain America. Exiles #3 is drawn by Dave Marquez. 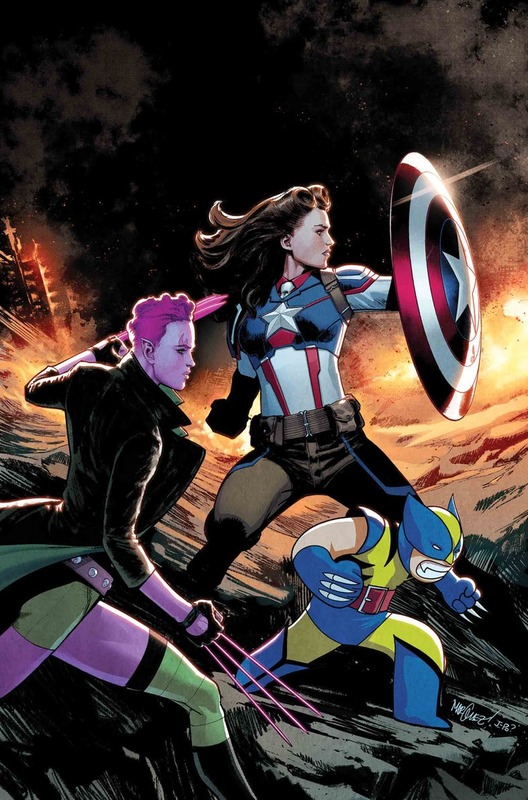 The issue will see Blink and cartoon wolverine team up to defeat the bad guys. But the one that really stole the show is Peggy Carter dressed as Captain America. Die-hard Carter fans will know that this book is not the first to show Peggy as Captain Carter. 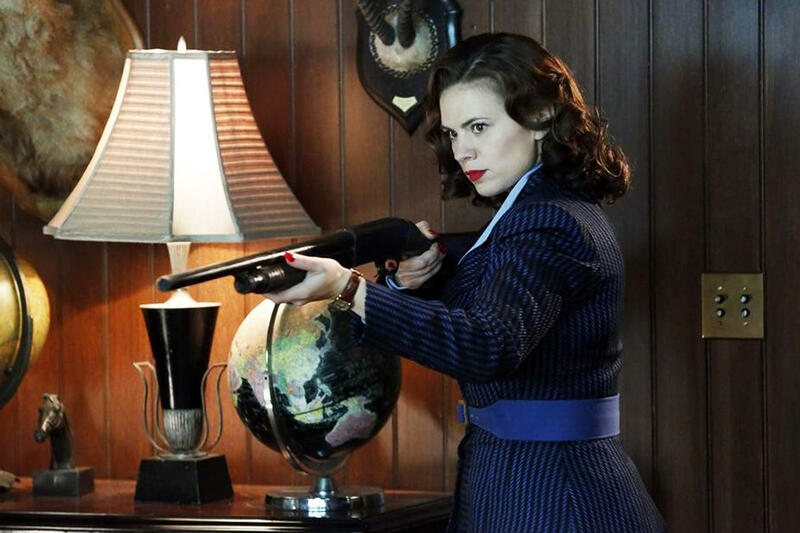 With so many parallel universes existing in the Marvel Universe, Peggy Carter has handled the Shield on more than one occasion. 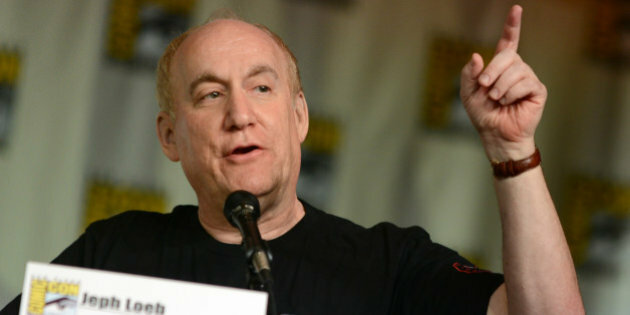 In 2016, Marvel was celebrating its age-old legacy by launching a video game containing alternate reality versions and future versions of flagship characters. One of those characters was Sharon Carter, the child of Steve Rogers and Peggy Carter from another timeline. Sharon used a lance and was draped in red, white and blue. While Sharon is indeed getting a funko in the Marvel Universe, she has yet to be featured in the comic book pages. 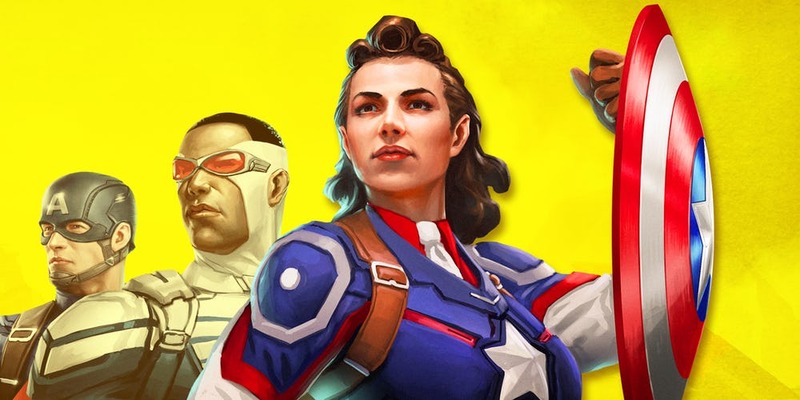 Puzzle Quest has already introduced Captain Peggy Carter, with a complete bio manual to introduce to the fans her entire backstory as to how she became the new Captain America. The story goes something like this – After Steve Rogers is assassinated by the Nazis before he could complete the Super Soldier Program, Peggy steps up in his place to become the Allies’ new champion. She then decides to grab the shield and go Nazi Hunting. The story from Puzzle Quest is used by the Exiles issue to take a leaf and use it in their Peggy Carter-Captain America version. The actual story of Peggy’s Captain America version is not yet known as of now. But it looks like she will be sticking around a bit. We would like to know more about Peggy’s star-spangled version. Keep it up, Marvel. After Thor, it is now Captain America who’s Ex-girlfriend has taken over his mantle. “I’d love to see Peggy more in films. I’d love to see her in her own film. And if we can keep evolving it so that she does new things so that I can surprise myself and she can keep surprising me then I’d love to do it. And I feel very privileged to be part of something that people really love and that entertains them. But also, you’re going to these conventions and meeting people who’ve named their son Carter and people who have a tattoo of ‘I Know My Value,’ the tagline”. How can we see her again, if ever, in the near future? 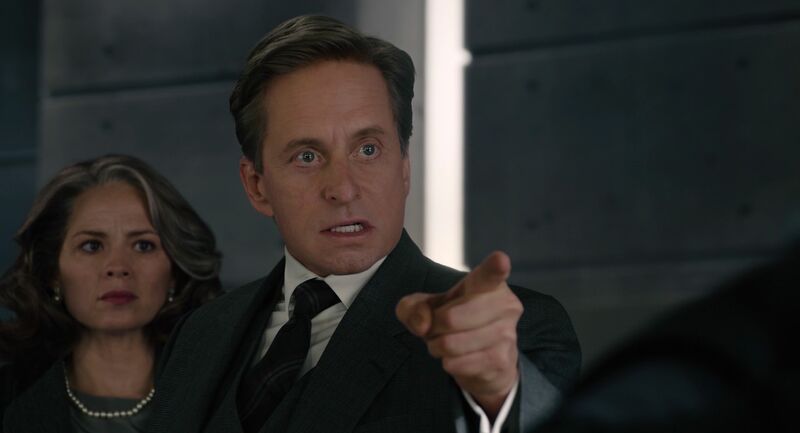 Some of the Marvel fans thought about this and have an interesting theory, here it goes: Since Captain Marvel movie is based in 1990’s then she must be Director or senior agent of S.H.I.E.L.D at that point of time, surely a scene or two can be added where she is working secretly with Hank Pym to take down Skrulls. Well, we can only wish we see her again.